Ald. 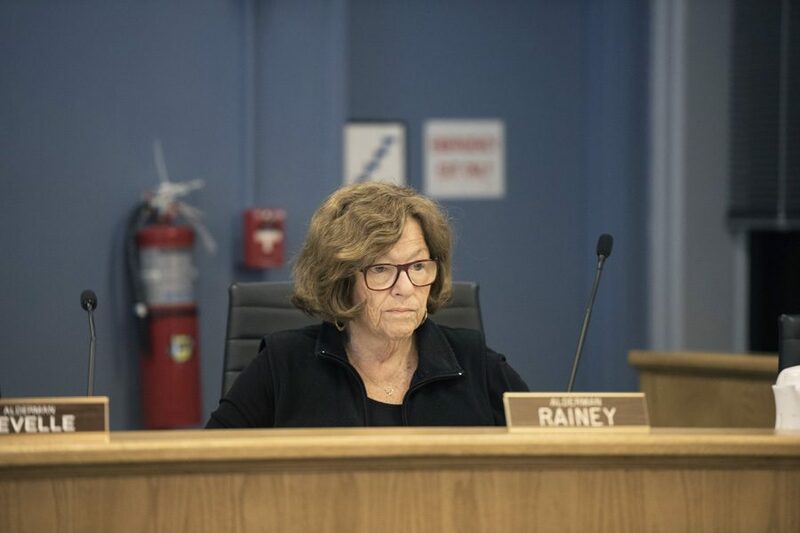 Ann Rainey (8th) attends a city meeting. Rainey said she “couldn't be happier” that the restaurant Good to Go was moving into a space at 711 Howard St. The Economic Development Committee approved a $50,000 storefront modernization grant to the owners of Good to Go, a restaurant specializing in Jamaican cuisine, last week. Lenice and Tony Levy, Good to Go’s owners, are relocating their business from the Chicago side of Howard Street to the Evanston side of the street. They applied for the modernization grant in order to renovate the interior of their new space at 711 Howard St. The renovation would allow Good to Go to expand their restaurant and catering business with a larger kitchen and more room for customers to sit. Lenice Levy said the modernization grant will assist in “massive” renovations, and that they needed the additional funding to cover costs for the renovation. The Levys, who have been Evanston residents for about 20 years, had been trying to move their business to the Evanston side of Howard for years but kept encountering “roadblocks” along the way, she said. “The biggest and most exciting thing about this is that in spite of all of that, we were able to actually to secure a building in the same vicinity where we wanted to be, on the Evanston side,” Lenice Levy said. In May, the Levys expressed interest in acquiring a city-owned property in the 700 block of Howard Street, but were denied because the city offered the space to Strawdog Theater, then the intended tenants for the proposed Howard Street Theater. Ald. Ann Rainey (8th), whose ward encompasses the new storefront, said at an Economic Development Committee meeting last week that she supported the relocation because the building the Levys purchased has been off of the city’s tax rolls for a while. The property is in the Howard Street tax increment financing district, and part of the taxes from the restaurant will now go into the district, Rainey said. “I couldn’t be happier and I’m going to do everything I can to help them along the way,” Rainey told The Daily. The city also approved a second recommendation for funding for Good to Go at the meeting, a Community Development Block Grant business loan of $25,000. The loan has a payment period of 10 years and defers debt payment until the second year of the loan, Sarah Flax, housing and grants administrator, said at the meeting. Flax said the loan’s funds will be restricted to spending on equipment, which can’t be bought through the modernization grant. It can be hard to earn a profit after a move and restaurant expansion, Flax said. “They won’t be paying until the start of the second year, which gives some debt relief and just helps in that early first phase,” Flax said. The new location is twice as large as the old one, and will feature an outdoor patio dining space and a room available for private events, Lenice Levy said. She said she is looking forward to the opportunity to be able to have their business located in their hometown. The timeframe for the buildout is estimated at five to six months, and Good to Go is expected to open in its new location in late summer or early fall, Lenice Levy said.